Start reading Descartes on your Kindle in under a minute. 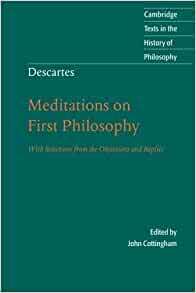 This authoritative translation of the Meditations, by John Cottingham, is based upon the best available texts and presents Descartes' central metaphysical writings in clear, readable modern English. There is a new comprehensive introduction by John Cottingham and the classic introductory essay on the Meditations by Bernard Williams. 5.0 out of 5 starsKnowing a first-class philosopher and speaker. Unmissable! Essential in order to understand human behaviour. Seductive arguments. Smart! Amazing book I would recommend to any friend! Good read, but for a layman like me a heavy one. I struggled to read in big chunks, pacing and breaks are key! Not one for the holiday perhaps but nevertheless an essential piece of work for anyone with an interest, general or otherwise, in philosophy. One of my favourite philosophers, this book is great. Arrived quite late but it wasn't a problem. A good sized book with a very readable font. Bought for studying, not pleasure. Was informative and easy to follow. Came quickly.